Before Churches Had Songbooks, There Was 'Lined-Out' Gospel Hidden deep in the hills of Appalachia, there's a tradition of worship music that has not changed since the 18th century. The hymnody is still practiced by congregations of the Old Regular Baptist Church, where a leader calls out a line and the people respond in a mournful, soaring chorus. Church elder Elwood Cornett preaches at a recent reunion of Old Regular Baptists. Brother Don Pratt is seated behind him in a blue shirt and tie. 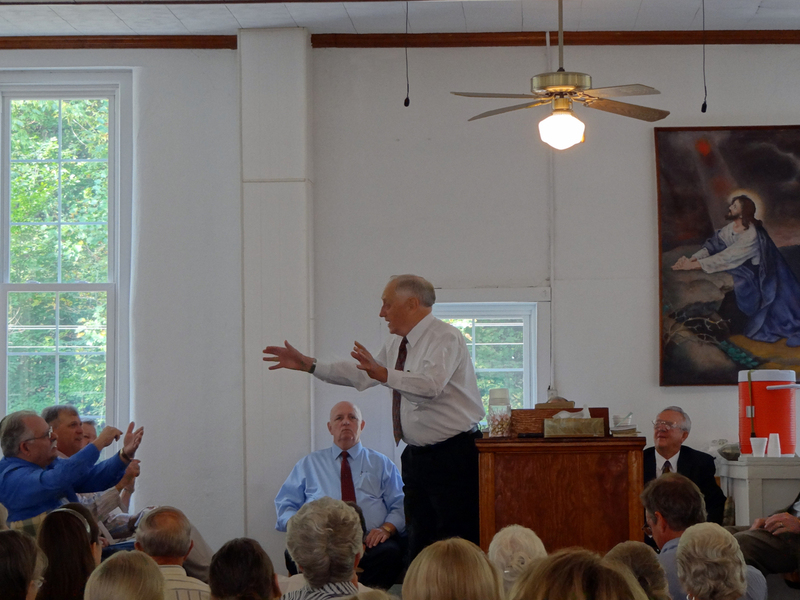 On a Saturday morning in September, several hundred men and women — many solidly built, with square faces — have gathered in a Depression-era building to worship and sing. They settle into green-cushioned pews in a large, well-lit sanctuary. One of the men sitting behind the pulpit, under the picture of a kneeling Jesus, feels moved to start a song. "Let milk and honey flow..."
He sings a line of a hymn. Once the congregation recognizes it, it repeats the line in unison, its voices swelling in a minor mode. This is what's called lined-out hymnody. "When shall I reach that happy place..."
Unlike the Southern a cappella tradition of sacred harp or shape-note singing, lined-out hymns have no musical notation. People listen, and they sing. The tradition began when churches didn't have songbooks. The Thornton Old Regular Baptist church in Mayking, Ky., sings "I'm Going Home" in lined-out hymnody. This footage was captured by musicologist Alan Lomax in 1983. "I've grown up all my life hearing these songs," Geraldine Ison says. She drove here from Blair Branch Old Regular Baptist Church in Letcher County, Ky. "When I was younger, I didn't like 'em. I thought they were too sad. But now I love 'em." She has come to the annual reunion of the Indian Bottom Association — the largest group within the various branches of the Old Regular Baptist Church, and the one that has worked hardest to preserve these old songs. "My mother, I can remember her singing 'Little Bessie,' something real sad, and I begged her not to sing," Ison says with a chuckle. Church members say they don't consider this music sorrowful. "As far as being just mournful, sad singing — and a lot of people look at it that way — it's not really," says Danny Amburgey, a retired state road inspector. "If you know the song, know what we're singing about, we're giving praise to God." Don Pratt, retired assistant school superintendent and clerk of the Indian Bottom Association, adds: "It's been a part of my life from the beginning, and it's a joyful sound. It's a sound that touches your heart." The Smithsonian Folkways label has released two CDs of songs by Old Regular Baptists. These hymns are considered the oldest English-language religious music passed down orally in America. At noon after the Saturday-morning service, the ladies of the church have laid out a feast: fried chicken, ham slices, field peas, deviled eggs and cornbread. For dessert, there's banana pudding, dirt pudding, cherry pie, apple pie, vanilla cake and dump cake. This is southeastern Kentucky where the morning mist settles in valleys like milk in bowls; where a quarter of the population lives in poverty; and where isolated communities are bound by food, family and faith. But the tradition in Appalachia is more than sacred song. The music is part of the moral universe in which the Old Regular Baptists dwell: a vivid faith life of baptism in cold-water creeks, repentance and salvation. "Yes, I want to go to heaven some day..."
Brother Don Pratt chants in a spontaneous sermon while the rising voices of the congregation wrap him in song. He is one of a succession of pastors, called moderators in the church's tradition, who step up to the pulpit for spontaneous sermons. 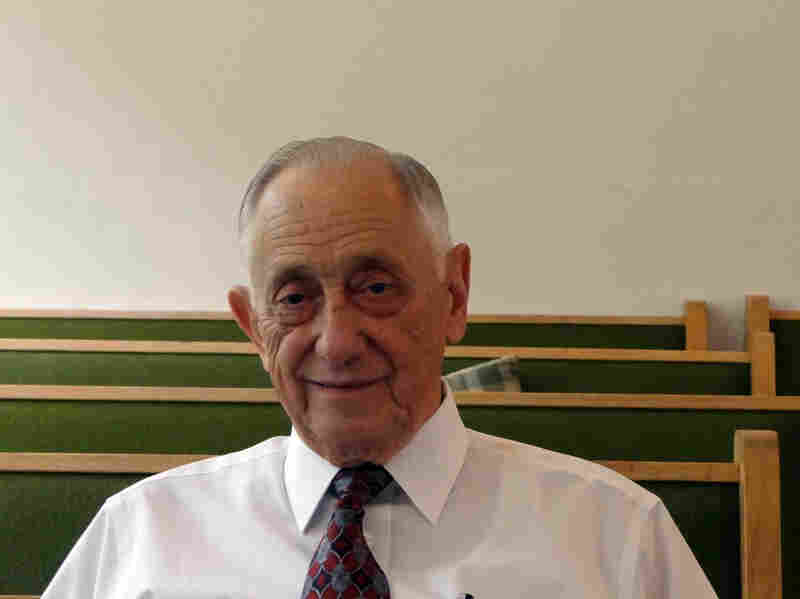 "I want to hear him say when the gates swing wide..."
The preacher who brings the service to a crescendo is Elwood Cornett, a 76-year-old retired school administrator who is moderator of the entire Indian Bottom Association. Elwood Cornett is the moderator, the church's term for preacher, of the entire Indian Bottom Association of Old Regular Baptists. "Wooooooo, but the key is Jesus," Cornett intones, as a woman in the congregation shrieks in spiritual elation. "Glory, glory, glory, let Mount Zion rejoice!" His arms are wide and his face contorts in piety. According to attendance records announced at this year's reunion, 1,744 Old Regular Baptists in 41 congregations make up the Indian Bottom Association. But their numbers shrink a little each year. The room contains mostly gray heads. Elwood Cornett worries about continuity. "My grandfather was born 100 years before I was," he says. "My mother said that he sang this very way. And I sing this very way. And I'm committed to doing what I can to keep this sound alive. I want it to be around 100 years from now." While the Old Regular Baptists wait on the Lord to return, they sing their sacred songs here in the mountains — living, as they say, "in the world, but not of the world."